A helicopter is preparing for departure atop the Mealy Mountains in Southern Labrador after passengers have explored the landscape. Passengers who have come aboard this helicopter for an unique adventure of the Mealy Mountains in Southern Labrador, Canada, must prepare to pack up for departure. The Apple Mac laptop and all necessities must be ensured they are loaded on the helicopter so the adventure of Southern Labrador can continue. In the backdrop, the sound of the water rushes by as it makes its way down the Mealy Mountains enroute to its next destination. 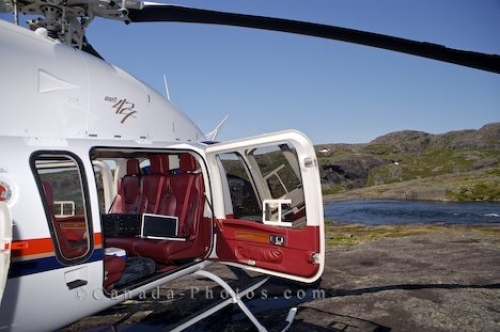 Apple Mac laptop on the seat of a Bell 427 Helicopter beside a waterfall in the Mealy Mountains in Southern Labrador, Labrador, Newfoundland Labrador, Canada. Picture of a helicopter and its departure area in the Mealy Mountains in Southern Labrador, Canada.